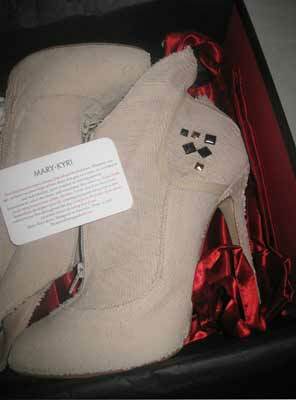 Mary-Kyri’s first celebrity recognition came with Australia’s very own Kylie Minogue stepping out in the signature design ‘Elisav’ in Manchester England in 2007. The image of Kylie graced newspapers and magazines around the globe bringing international acclaim to the Australian designed brand. Soon after many international celebrities and stylists followed requesting pairs of Mary-Kyri Shoes for Kim Kardashian, Jennifer Lopez, Dannii Minogue, Katie Holmes, Emma Booth, Tamara Ecclestone, Delta Goodrem and Sarah Jessica Parker.